The steamboat El Dorado is sailing down the Amazon in the early 1900s. The passengers are travelling to hear the legendary but intensely private opera singer Florencia Grimaldi sing at the reopening of the theatre in Manaus. Riolobo, a mystical character who can assume many forms introduces the embarking passengers: Paula and Alvaro, a middle-aged couple attempting to rekindle their marriage; Rosalba, a journalist researching a biography on Grimaldi; and Florencia herself, travelling alone and incognito, harboring a burning desire to find her long-lost lover Cristóbal, a butterfly-hunter, whose love unlocked her staggering powers of musical expression. Once en route, Rosalba accidentally drops her research notes overboard. The Captain's nephew, Arcadio manages to rescue them, and the pair becomes aware of a strong mutual attraction. The evening concludes as Paula and Alvaro's attempt at a romantic dinner dissolves into a bitter quarrel. Initially unaware of her identity, the Captain tells Florencia of the fate of Cristóbal, who disappeared without trace in the jungle, thus dashing her dearest ambition. As a heated card game brings out the contrasting sexual and hostile tensions between Rosalba and Arcadio, and Paula and Alvaro, a violent storm brews outside. In saving the ship from being crushed, Alvaro is swept overboard; the Captain is knocked unconscious and despite Arcadio's efforts at the helm, the ship runs aground. Paula mourns the loss of Alvaro, realizing that it was pride and not lack of love that stood between them. Riolobo appears again mysteriously to return Alvaro to the ship, claiming that Paula's laments saved him from death. Rosalba, distraught that her notebook has been ruined in the storm, talks to the incognito Florencia about her research. During the ensuing discussion on Grimaldi, Florencia declares passionately that Grimaldi's gift was a result of her love for Cristóbal. Rosalba realizs that she is talking to her heroine and, hearing her story, decides her own love for Arcadio shouldn't be suppressed. A relevant programme note is available on the Florencia en el Amazonas (Orchestral Suite) page. The reconstituted New York City Opera should be bursting with pride at the high level of quality extending across every aspect of this presentation...This production makes it clear that the company is at the very top of its game. This Florencia fulfills one of opera’s highest duties: to leave the listener’s senses swooning. Catan was indeed influenced by more recent composers such as Igor Stravinsky, but his music above all "sings" and avoids the aridities of much 20th century modernism... Catan's orchestral music not only resembles Puccini but also Richard Strauss, and Eduardo Diazmunoz conducted an impassioned reading of its splendors. Catan aims high at the end of this work. When Florencia is transformed into a butterfly, this act is given music to resemble an apotheosis, evoking comparisons with the ending of Richard Wagner's "The Twilight of the Gods" or Richard Strauss' opera "Daphne." 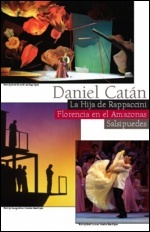 Daniel Catan's Florencia en el Amazonas was [Cincinnati Opera's] first mainstage opera in Spanish. Audiences took a chance on the work and were most pleased with its lyric beauty and lush orchestration. Steven Mercurio's conducting generated the appropriate exotic atmosphere...Audiences cheered with delight at the gyrations of the riverboat and gasped at Rio Lobo's dramagtic descent from high above the stage. When Florencia was turned into a giant butterfly during her 'Brazilian Liebestod', we were all mesmerized. Daniel Catán's gossamer FLORENCIA EN EL AMAZONAS proved one of the company's most popular creations. Francesca Zambello's elaborate presentation on a rotating riverboat drifted into perfection. Stage director Andrew Morton and conductor Patrick Summers have distilled this opera about strangers sharing an Amazon voyage into a series of dreamlike musical and theatrical sequences. Catán's Puccini-esque score and the balanced love stories blended seamlessly with the scenic treatment, aided by Angela Scimonelli's dancers, playing all sorts of river spirits, usually spiriting billowy fabric. Florencia Grimaldi, a celebrated opera singer and the fulcrum for the story is ultimately disappointed in her quest to find her early lover; soprano Patricia Schuman made us feel her loss. [Catán's] FLORENCIA has found favor with other companies than HGO, but I fear it is still underestimated. Its richly lyrical score echoes previous strains of neo-Romanticism, but establishes its own determined voice as well. Recordings should make this Spanish-language opera a standard the world over. FLORENCIA is a beautifully crafted work. We immediately discover our characters' personalities through their music and words, whether it's [the] opening seven-minute monologue or [a] beautiful, dreamy, pianissimo-filled aria in scene 4. And underneath it all is the inexorable movement of the sea...There is a stunning ensemble in scene 8 in which all of [the] characters express their dreams; it is as well written as anything in the best of 19th-century opera...ravishing, ecstatic, moving, and filled with awe. The music glistens like sun on the river; it is graceful and ravishing. And, in case you haven't figured it out, it's absolutely tonal...in the face of such exquisite music, music that drinks the listener in sensually...it flows and flows, uninterrupted...I'm enchanted. This is a gorgeous, fascinating, familiar-yet-new experience, and I recommend it to everyone. The world-premiere engagement of Catán's FLORENCIA EN EL AMAZONAS, in 1996, was one of the most successful in the history of Houston Grand Opera. This recording, taped during a 2001 revival, makes it easy to hear why. It is a ravishing piece of music, written in an unabashedly tonal idiom that just recently had seemed extinct - Ravel and Szymanowski, by way of Villa-Lobos. Moreover, the opera's central theme  the transcendent power of love  is a compelling one, given dramatic flesh by the composer's rapturous musical invention. In an era when so many new operas are weighed down by familiar literary and theatrical texts, FLORENCIA seems motivated by its music: it surges forward in gusts of lyrical inspiration. It's a theatrically canny work that moves swiftly [and] the opera's characters and plot are original. The HGO closed its 2000-2001 season with a revival of its most popular commission, the Mexican composer Daniel Catán's FLORENCIA EN EL AMAZONAS. FLORENCIA is a self-proclaimed 'homage' to the 'magic realism' of Colombian novelist Gabriel García Márquez. The Spanish-language libretto tells how five people find meaning, fulfillment and transcendence during a boat trip down the Amazon. Catán's luxuriantly colorful score blends Puccini, Ravel and a whiff of Villa-Lobos, and gives the singers lots of opportunities for ripe, soaring melodies.